If I ever had a Subaru Impreza, I'd be the happiest man on earth. I would live in a shack and sleep on a mat and it wouldn't matter. That is just me. But then there are others. They have a Subaru Impreza WRX STi that they use everyday on the streets. They also have another Impreza. One that they use to mess around in the dirt and win a few trophies here and there. Who are they? Team Kajah Motorsport and its head honcho A Zuhin. The Subaru Impreza WRX is one of the best all-round cars to have ever been produced, period. Only a few cars have made an impact like the turbocharged Impreza in the tuner and rally world. It's a car that was developed in the nineties to primarily take part in the world rally championship. It did just that and went on to actually win at its debut and give Subaru three consecutive WRC titles. 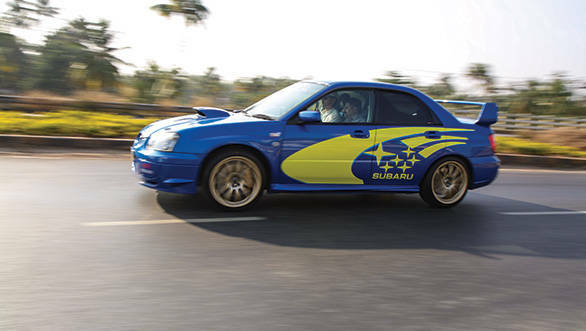 Think of rally heroes, Colin McRae and Richard Burns and it's the airborne rally blue Impreza in contrasting triple five colours and gold wheels that will come to your mind. Even rally legend, Ari Vatanen drove an Impreza in the car's debut rally and finished on the podium. Thanks to FIA homologation rules, the car was offered to the public in road form and this has made it an enthusiast's choice over the years thanks to its high performance to price quotient. It's an all-wheel drive car that you can race, rally or even take your kids to school in, thanks to its four doors and seats. It is a practical sportscar. Zuhin is a Subaru fanboy and the man who drives both the Imprezas you see here to the limit and then some. The blue Impreza WRX STI is his road car for street use. It may look like a stock WRX STI but under the hood it packs a Mohammed Ali punch. The standard 2.0-litre boxer engine has been bored and stroked to 2.5 litres by a little-known company called Cosworth. There is also a bigger turbocharger from Tomei. The motor has been blueprinted and special light pistons have been used. The fuel injectors, clutch and flywheel and exhaust system are all upgraded as well. To get the engine map to adjust to all the additional mods, special software from Ecutek has been used to flash the stock ECU. This helps the engine extract close to 400PS. That's as much power as a flat-six engine from the Porsche 911 Carrera S coming out of a flat-four engine. To improve dynamics, fully adjustable suspension from TEIN has been installed. The red Impreza WRX STI you see here is a rare spec C variant that is essentially a homologation model limited to only 1000 numbers to satisfy the requirements of the FIA to enter racing and rallying championships. In comparison to the street car, it produces a lower 280PS but that's because this Impreza is an APRC spec rally car that meets the FIA Group N rally regulations. But then the spec C is also lighter than the WRX (90kg to be exact). This is possible thanks to a lighter roof, aluminium boot lid and lighter windows. Other noticeable differences include an upgraded turbocharger, manually adjustable centre differential (for a customised power distribution setting) and larger brakes. 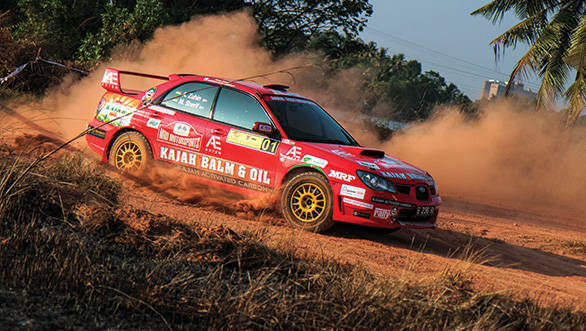 This car was then further modified by Rafiq from MRU motorsport, Malaysia. The car's interior was stripped down and an FIA approved roll-cage manufactured by Possum Bourne Motorsport, New Zealand was welded on. The MacPherson suspension is beefier in the spec C model but to make the car more competitive, suspension made by Reiger and fine-tuned by Tommi Makinnen Racing (leaders in developing rally Imprezas) has been used. 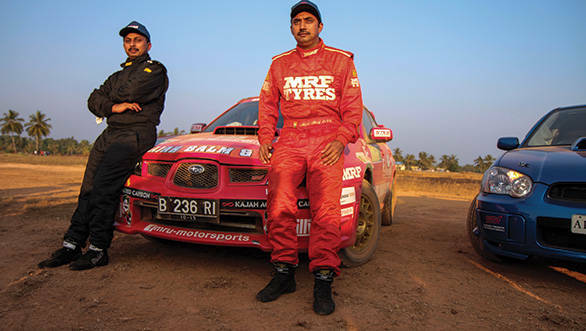 This Impreza took part in the Indian Rally Championship last year and even went on to win its maiden championship with Zuhin behind the wheel and navigated by ace navigator, Musa Sherif. 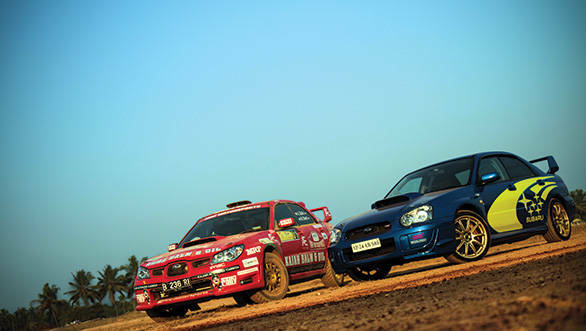 Both the cars then are different from a standard Impreza WRX STI but both take the Impreza's road and rally capabilities to extremes. The road car can be fun around a racetrack or simply outperform many cars in the same power category on a drag strip. 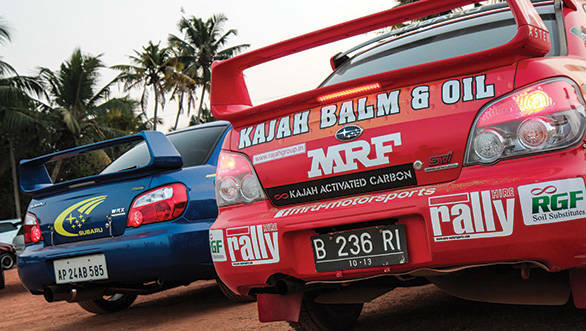 The rally Impreza meanwhile can go as fast on dirt as some fast cars do on tarmac. The road car sprints to 100kmph in 4.5 seconds, a 21psi turbo boost means one is literally thrown back hard onto the seat when the turbo kicks in. The revs climb so fast that the window for a perfect shift is as narrow as Kate Moss' waist. The rally car though, has launch control and does a perfect launch every single time. The sprint to the ton however comes up in a little over 5.5 seconds and with dirt tyres it has a disadvantage here. However, venture onto the rally stage and the road car can't keep up and only gets to glimpse the fire spitting out of the rally exhaust. The TEIN suspension setup and lightweight Prodrive wheels on the road car may be perfect for street and race use but the Reiger suspension with rally wheels and tyres are way more complicated and purpose-built for varied surfaces including floating over rocks, and broken tarmac or even jump over the road car to make you feel like you've just entered a cheat code in Colin McRae rally 2. And the video game connection doesn't end there. Look at the road car and you'll think it's the same blue Impreza from the game. However it is actually a tuner car and a peek at the big fat Blitz Nur spec racing exhaust will tell you this. The rally car though has real competition and sponsor stickers, stands taller and has a ready-to-attack stance. Oh, and it is painted red. The Racetech FIA approved competition seats are the real deal here unlike the road car's race imitation bucket seats. So who's the winner? If you asked that question please find the nearest cliff, stand on its edge and take one more step. It would be like asking which is more awesome  bacon or ham. They both taste different, but at the same time they both bring about the same kind of emotion. A sense of satisfaction unlike any other. Except maybe an Evo. But that's for another day. For now I need to make an excuse to get back to Chavakkad to put some more miles on the twins. Zuhin, you listening?